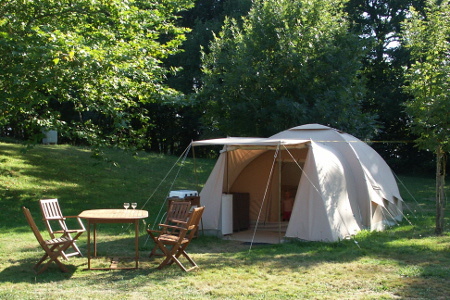 Are you looking for a nice small and cosy family campsite with swimming pool, paddling pool and stunning rent tents in southern France? Ideal for people who love peace, nature and pure mountain air. Come to Camping Le Plô and enjoy scenic walks through the Sidobre, a great adventure for the children who can climb the huge granite rocks. And unwind with pleasant nights at Le Plô. The Atlantic climate and its location 640 meters provide the fresh green appearance, while the Mediterranean climate provides the necessary sunshine. Camping Le Plô located on the edge of a small village in the Tarn department and in the nature of the Haut Languedoc: the land of Sidobre, land of granite! Forests, hills and mountain streams and huge boulders of granite surround us. Do you like walking in the mountains, adventure trekking, pure air and tranquillity? Enjoy beautiful valleys and vistas that change in colour every season? Are you a camper who likes to camp on a real green campsite with quiet, great camping sites without caravan homes? Then you’ve come to the right place. For small children under the age of 12 it is a little paradise here. Playing outside all day and in the evening tired and satisfied to crawl into the tent. We welcome you from the first of May to late September, the pool is open from 15 June to 15 September and takeaway meals are available during the same period. Rent a tent; We have beautiful tents for 4 or 6 persons. The 4 persons tent is on the image above. Click for more information on the rentals button.